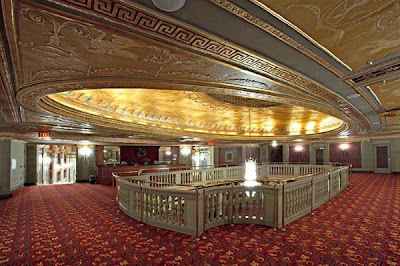 Two weekends ago, I volunteered my services at the multi dress shop sample sale at the Palace Theater in Waterbury, Connecticut. One of our favorite brides owns one of the boutiques that participated, (The Wedding Embassy), and I had the best time catching up with her as well as taking in both the draw dropping venue and the gown sale. It was so much fun to witness girls fall in love with such gorgeous and affordable gowns and to hang with some of our favorite vendors. In particular, there was a fabulous Eve of Milady gown marked from $4k to $1k. HELLO. I really hope someone walked away with that dress. It did not deserve to be left behind! Check the ceiling detail and the chandys!! Swoon. Rainy wedding day? No problem! There are loads of incredible photo opps within! Two of our favorite caterers had set up some amazing booths. I loved the fun splash of green against the swanky black and white linens from BBJ that Emily's Catering had set up. Tara Coakley, who we have worked with on many events, did all the flowers herself! I also had a blast chatting with Debbie & Audra and of Jordan, who set up a divine breakfast in the entrance. We are looking forward to seeing them a few times this year at our GYC weddings! They used Party Rental for their set-ups and got the job done right with their cheeky display! We also caught up with Sweet Maria herself (couldn't miss a chance to sample one of her out of this world cakes!) and Aurora photography. Check her blog; she has some amazing shots of the fashion show that took place later on that day. 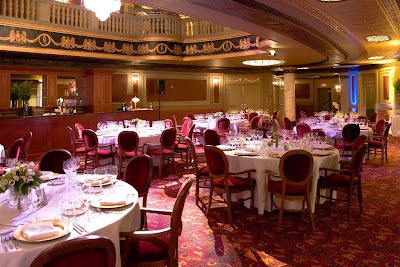 Both caterers spoke of the incredible architecture and how much they loved doing weddings at the Palace Theater, whether full out on the stage, or with mixed locations between the grand foyer (for cocktails and dancing) and mezzanine upstairs for dinner. The Poli Club is also sweet for smaller parties. 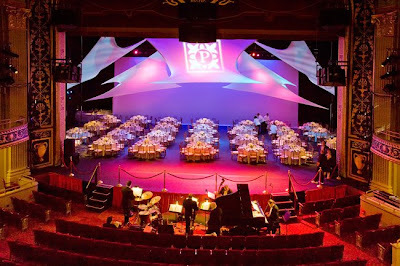 I left the event truly captivated on how different and fabulous the space is and how much I would love to do a wedding there, so of course I called to get all the info. Rental fees range from $2500-$9500 depending on the day of the week and space desired. For specifics, see the on-line brochure or contact Mike Cammelletti via email or at 203-755-8483 x 108. Last but not least, the STAGE! 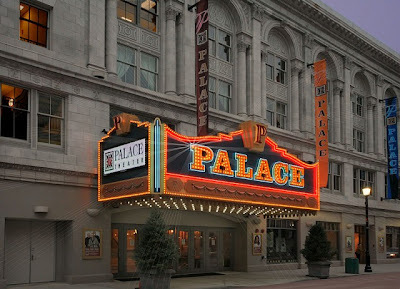 I've always thought about what a great wedding venue The Palace would be! Great blog post girls! Thanks for the love ladies it was good to see you again I look forward to working with you ladies at Meg's wedding this September! !